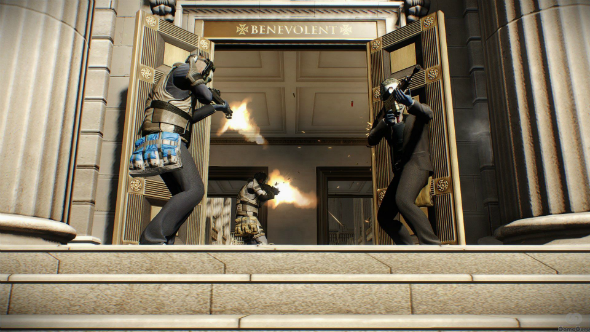 Another Payday 2 DLC, titled Big Bank, is going to be launched for PC today. In developers’ opinion, it will be the largest and the most interesting update throughout the shooter’s history. In the fresh Payday 2 DLC the players must try not to fall into hands of the well-trained guards and break into the huge vault , which is situated in the big Benevolent bank and is equipped with the most reliable security devices and alarms. Once the gamers complete the mission successfully, they will get the high reward for the done work. Besides that, a new character - Dentist - will appear in the upcoming add-on. He will be voiced by the popular actor - Giancarlo Esposito, - who starred in Breaking Bad TV series. Dentist will become the key person in the new Payday 2 DLC, because his main task is to prepare the gang for the most important and great heist. Making the robbery plan, the players will be able to discuss with each other the principal moments, assign the duties and also take a look at the drawings of the building. Moreover, one of the add-on’s central features will be the ability to re-complete one or other tasks. According to the developers, each new walkthrough will differ from the previous one. That will make it more thrilling and impressive. The new Payday 2 DLC will cost $6.99. Together with its release, the shooter’s creators have promised to reveal the add-on’s launch date on PS3 and Xbox 360.